It’s that time of year again! Yes the big Back to Homeschool time has arrived and my fellow iHomeschool Network Bloggers (along with myself) are hosting our annual Back to Homeschool Basket Giveaways! I am pleased to be offering a Middle School Homeschool Curriculum Basket Giveaway that holds a few of our favorite (and current) curriculum choices and retails for around $145! 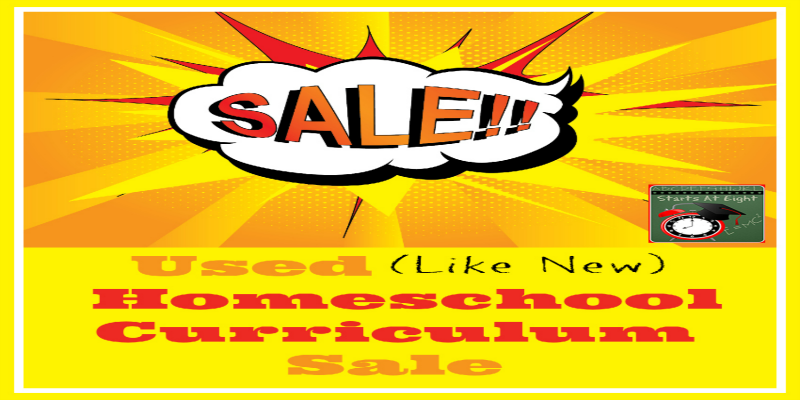 While you’re here, be sure to stop in and check out my USED (Like New) HOMESCHOOL CURRICULUM SALE! You will find things like Teaching Textbooks, Bright Ideas Press History, Coding Courses from Homeschool Programming, Saxon Math, Singapore Math, Shurley English and more! I have also just created Checklist Style Weekly Assignment Printable Student Planners! I needed something simple for my 9th grade son who is my “Just Wants to Get it Done” kid so I decided to create something that would work easily for me to guide him, and for him to keep up with! Hop over and check out the three variations I created – Rainbow, Heart, and Gamer! This timeline set allows you the freedom to print timeline figures in a variety of ways and sizes, to suit whatever project you’re working on! Figures in two formats: One with text descriptions for those who prefer an encapsulated summary, and one with only a name and date, allowing the child to add in the information, or for easier use in projects. Contains “Timeline Helps,” our website information of helpful ideas for using the figures with wall and notebook timelines, suggestions for use in a variety of resources and games, and tips for coloring and gluing the figures! PLUS the same 1260+ timeline images are offered as a gallery of high-quality GIFS that can be individually enlarged or reduced, allowing versatile uses such as coloring book pages, notebook timelines, complements to research papers, games, and more! Since they are individual images, you can pick and choose the exact figures you’d like without having to print off a whole page of extras you may not need at the moment. The images are organized in over 30 helpful categories, stored in web browser format: Chronological, alphabetical, and several classifications that help make topical studies a breeze! 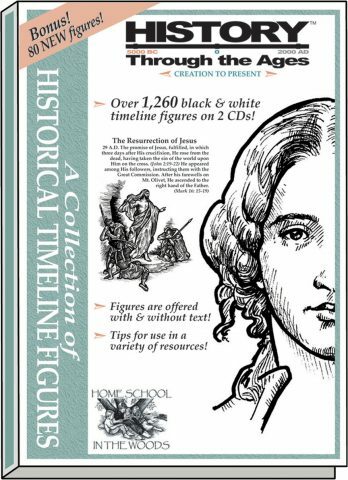 The HISTORY Through the Ages Collection of Historical Timeline Figures is the basis for our homeschool history this year! 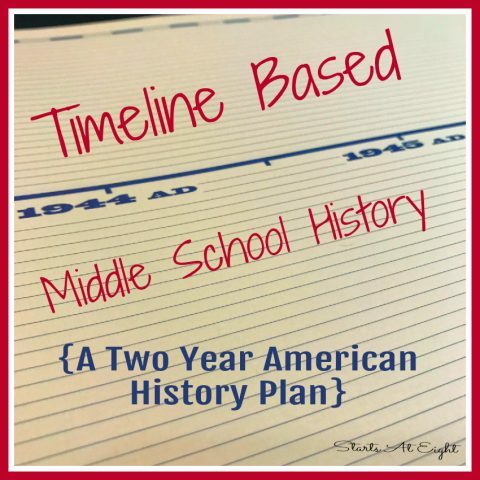 Check out how we are doing Middle School American History using these timeline resources! Mixing with the Masters will give you and your kids a FUN, hands-on way to connect with the old masters and some of their most famous works. By becoming involved in the same processes these artists used, the elements and principles of art will come ALIVE! We have used many of the courses Alisha from Masterpiece Society has to offer. This course will make up the spine of my 6th graders art for the coming year! 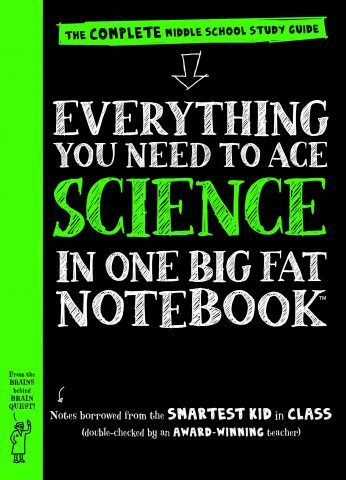 The Everything You Need to Ace Science in One Bag Fat Notebook is just one in a series of 5 study guide books for middle school age kids. We are currently using the World History one as a summer review (having just completed a World History study this year for 8th grade). While I don’t think these books stand alone as a whole curriculum, the do make a great review source. They would also make a great spine (or stemming point) for an entire course, adding in more resources such as literature, movies, and writing assignments. The BIG FAT NOTEBOOK series is built on a simple and irresistible conceit—borrowing the notes from the smartest kid in class. There are five books in all, and each is the only book you need for each main subject taught in middle school: Math, Science, American History, English Language Arts, and World History. Inside the reader will find every subject’s key concepts, easily digested and summarized: Critical ideas highlighted in neon colors. Definitions explained. Doodles that illuminate tricky concepts in marker. Mnemonics for memorable shortcuts. And quizzes to recap it all. 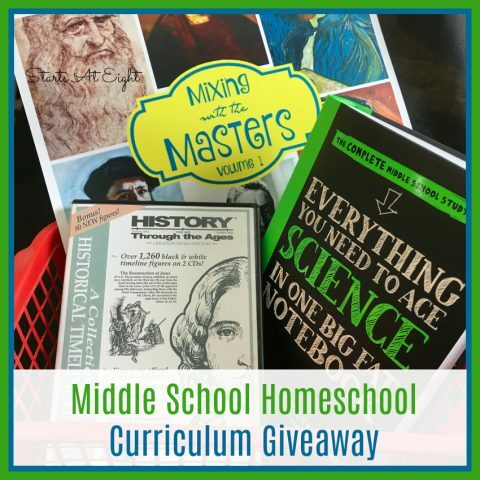 This Middle School Homeschool Curriculum giveaway is open to U.S. Residents only and ends August 14th, at 11:59 pm EST. 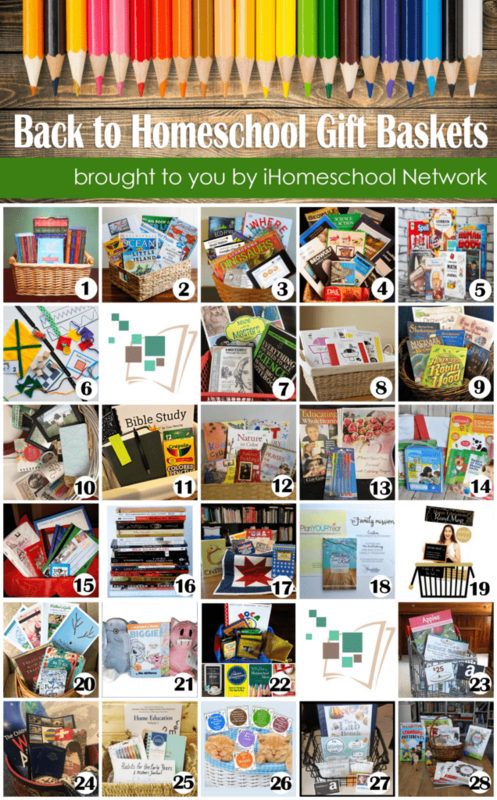 28 homeschool bloggers have joined together to provide one massive back-to-homeschool basket giveaway! Take a peek around these 28 sites and enter to win as many baskets as you like. Each blogger is conducting her own giveaway, so you never know…you may end up winning more than one! All giveaways will be live on Monday, August 7. (8) Life of Fred Math Books Gift Basket by Look! We’re Learning! (26) Back to Homeschool Online Music Course Giveaway by I Choose Joy! What an amazing giveaway! Thank you! I am heading to check out the checklist planner, will be great for my 7th grader. This looks like an awesome gift basket to win and would so benefit me this school year. What great choices for middle School! Thank you for the chance to win, these look wonderful. Thank you for this giveaway! So many exciting products! I hope I win! This would be great for my 7th grader! Amazing giveaway would be great for my middle schooler! What a great blog. So glad I discovered it. This is a brilliant give away! I would so very much adore having this for my son! This looks great! Thanks for doing it! Amazing. We start our middle school journey this Fall! I love giveaways for educational materials! Squee!!! This is an awesome giveaway for homeschool. Thank you for the opportunity. We have Everything You Need to Ace Math and it’s great! Would love to add Scence to our library! I would really love to have the timeline figures! Thanks! This would be great for my son that is starting middle school this year! What an awesome giveaway! I have been looking at the Big Books of Science etc and without funds this year for new books this would be a Godsend!! My boys would like the science book. Thanks for a great giveaway. Excellent giveaway, I’m really interested in Mixing with the Masters. Looks like a great bunch of material! I love your Middle School giveaway picks. They look like they would be so great for my Middle Schooler this year! Thank you for this opportunity! 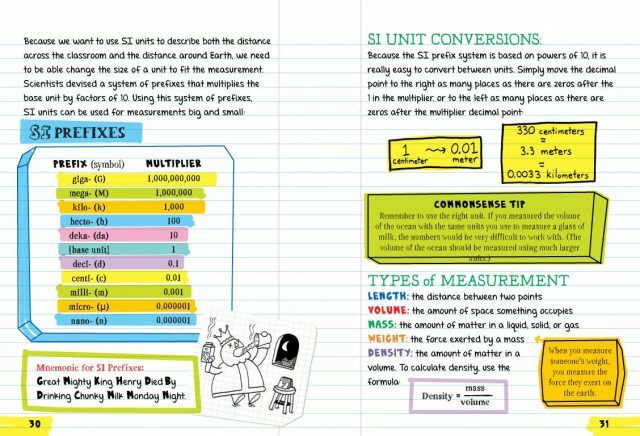 We have the Big Fat Math notebook and would love to win the Science! Thanks for such a great middle school mix! Thank you for the chance to win. The prizes look amazing! Can’t wait to try new materials with my 6th grader! There are several new-to-me resources that I’m eager to learn more about. Thanks! Mixing with the artist sounds like just what we’ve been looking for. These giveaways are wonderful! Thank you to all who helped make this possible. Amazing giveaway!!! 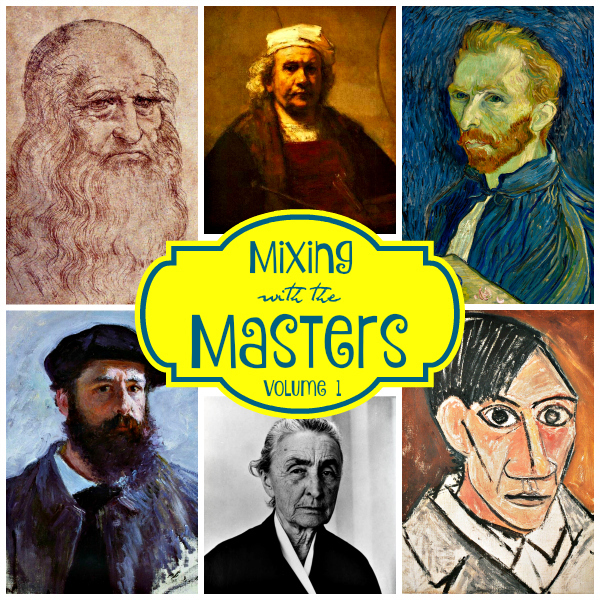 Really want to check out the Mixing with the Masters! This is a wonderful collection of resources. Love Home School in the Woods! the timeline of people of history is definitely intriguing! What an amazing opportunity, I would love to win this for my daughter. These are wonderful products and would make an awesome year. Mixing with the Masters looks like a lot of fun! Thank you for offering this giveaway. The items in this basket look great! This would be so great to win! We have 5 kids and one in middle school! What a great giveaway! Love these resources! It’s great to see something for the middle school group! Thank you! These all look like they’d be really interesting! These look like fabulous history resources and would be a great addition to our curriculum. Middle school seems so daunting! I have the science notebook in my wishlist! Would be great to win it instead! Great giveaway!!! Would make some excellent additions to our middle school year!!! These look great! I’m just still a little shell-shocked that I’m going to have a middle schooler!! ? I’ve been eyeing those timeline figures for awhile. This looks fantastic! Good luck everyone! This giveaway is amazing. Thank you! I have a son starting middle school this year so this give away is so timely! LOVE these resources, especially the Big Fat Science Notebook…these books look terrific…helpful, all-inclusive resources! Awesome giveaway! I’ve had my eye on those timeline figures for a long time. This is an awesome giveaway! Thanks for offering it. What a great giveaway. I love the big fat science notebook. We are first time homeschoolers. This looks like it would be great for my 7th grader. I am excited about this giveaway …. First year homeschooling .. My daughter is in 8th grade … I’m pretty nervous about about this but knowing there is plenty of tools out there for middle schoolers makes me relax a bit. This giveaway looks awesome! Every item is interesting and would be wonderful for my middle schooler. Ooooh, the Big Fat Notebooks…I have not tried those yet, but I really want to! They look really fun! Thank you so much for taking the time to make all this information available AND for the awesome giveaway!!!! The art book looks great! Mixing with the masters looks really neat! I would love to have these oops to teach with! Awesome giveaway! This would be great to use this coming year with my kiddos. Thanks for the chance to win! Those are all great items. They would make this year a lot more fun. I love the timeline download- I’ve been trying to figure out the best way to do a timeline at home. These look great! We love the notebooks, but do not have science yet! Thank you for the opportunity to win! Love the Big Fat Notebooks! They are a favorite at our house. We love the Big Fat Notebooks! We’re so excited about this giveaway! We are so excited about this giveaway! WOW! This is an awesome giveaway! And just in time too – as my middle DD is starting middle school!!! Thanks for this opportunity! This is awesome! Have been eyeing the Science book…love it! These are all great giveaways! Thanks so much! This looks perfect for my son! Thank you for the chance to win! This middle school lot of goodies is right up our alley! What a great idea to include planning resources for teens! I have a brand new middle schooler and this looks fabulous! The science book looks fun! This would be so helpful as this is our first year homeschooling and my daughter is starting middle school. Thank you for the opportunity to win. I will be homeschooling my 7th grade daughter this fall. Awesome items for my older children this year. Fascinated by the Mixing with the Masters! Thanks for the opportunity at this wonderful give away. We have always wanted to try the History through the ages for our timelines. My kids love timelines. I think the big book of science looks like something my kids would read just for fun. Thanks for all of the great opportunities to win! This would be a blessing to my 2 middle schoolers. Would love to win this giveaway. Thanks for these opportunities. Thanks for the opportunity to win this great collection! So stoked for this opportunity. Thanks! So stoked for this opportunity! Thanks a bunch:)!!!! Thank you for such an wonderful opportunity. The Big Fat Science notebook has interested me forever. The other things would be lovely also! I think my middle school daughter would really love these materials. Thank you for the opportunity to win this awesome giveaway! I am super excited about the History Through the Ages timeline figures. Excited to see so many of the programs books and curricula that I know I’m 100% interested in using and would have picked myself! What a great selection of resources! This is an awesome giveaway!! I would be so thankful to win this since my husband and I are on an extremely tight budget due to him retiring from the Army after 20 years of service. what an awesome giveaway, thank you for the chance! Have a new to middle schooler so would love to win these books. Thanks. The history timeline looks really cool. These are great resources! Thank you.